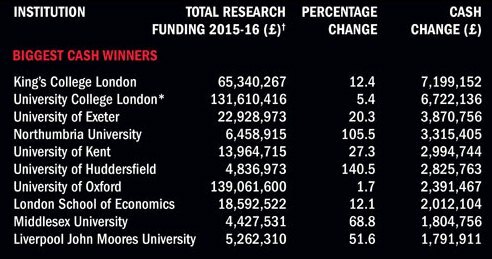 Middlesex University has received the highest percentage increase in research funding across London following an announcement on Thursday 26 March by the Higher Education Funding Council for England (HEFCE)*. Middlesex was also named top modern London university for total research funding and in the top 50% of English institutions*. 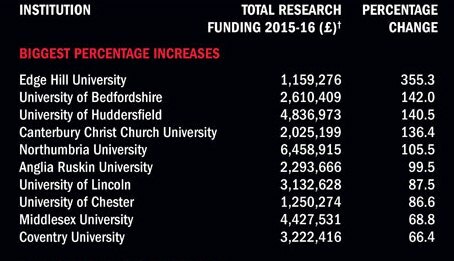 The boost will see an almost 70% increase in the University's research funding following a £4.4m per annum recurrent grant. The funding follows the University's excellent results in the Research Excellence Framework (REF), the national independent audit of university research. Middlesex was ranked as the best modern university in London for research power, an industry assessment of research quality and impact, and close to the top third across the entire sector. The HEFCE allocated £1,558 million of funding on research this year to universities selectively, focusing on world-leading and internationally excellent activity. Middlesex is leading the way on research, directly influencing government policy and benefiting society. Greater improvement in policing and child protection based on our research into child sexual exploitation has seen academics train the Metropolitan Police and Child Exploitation and Online Protection Centre (CEOP) in the online grooming of children. The Whistle-Blowing Research Network at Middlesex has also made a substantial contribution to protecting whistle-blowers in the UK and abroad, and has recently directly influenced recommendations from the Freedom to Speak Up review into the NHS. The research carried out by the Flood Hazard Research Centre has been central to the assessments of flood defence system investment, which is used by the Department for Environment, Food and Rural Affairs (DEFRA) on national flood risk. The PROMISE (Promotion of Mental Health Minimising Mental Illness) project led by Middlesex University has allowed the voices of those suffering mental health issues to be heard through a set of guidelines for professionals working with mental health patients. Artscross, a cross-cultural exchange project with the Beijing Dance Academy, promotes international communication and understanding between the UK, China and Taiwan. This large scale performance project looks to improve intercultural artistic relations between the partners and connects academia more intimately with the arts profession. A new material Argentium Silver was developed at Middlesex, which is sold in high street shops across the country and has allowed craft jewellery makers to extend their design practice around the world. Professor Waqar Ahmad said: "We have been ambitious in driving forward excellence in research. This announcement reflects the contribution to research and its impact, in and outside academia, being made by our world-class research community at Middlesex." "Our research across all disciplines has real world impact that cuts across sectors and can be felt by society, industry and communities." *Statistics provided by Higher Education Funding Council for England (HEFCE) data. Table ranking sourced from Times Higher Education. Images courtesy of Times Higher Education. Click here to see the full infographic.